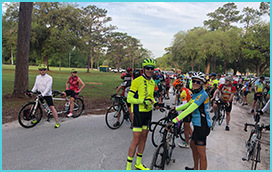 The 39th Florida Bicycle Safari will be held April 13-18, 2019. Come join us for a springtime cycling adventure that features six days of riding in beautiful North Florida and South Georgia. The six-day Safari is limited to 250 riders. For those who cannot do the full six days, we do offer a three-day option. Though the three-day riders only get half the full Safari experience, it is still loaded with rides, activities, and entertainment to bring joy to your cycling life. 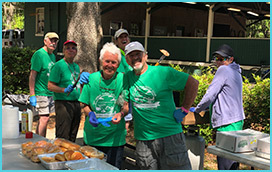 The first two days will be based at the Suwannee County Fairgrounds in Live Oak, Florida. Different routes will be offered each day with several mileage options, including a century on Sunday. Monday, while the three-day cyclists loop back to Live Oak, six-day riders will head north past the town of Madison. The Safari will camp at the Cherry Lake campground for three nights. The Cherry Lake campground is majestically located just off a scenic lake that offers serenity and tranquility before and after every ride. A different route will be featured each day, again with several mileage options, and will include a century on Tuesday. Each day will start with a buffet style breakfast with eggs or pancakes, sausage, oatmeal, fruit, yogurt, cereal, muffins, bagels, juice and coffee. On the rides, there will be sag stops with all the goodies to keep you hydrated and fueled. Dinners will also be buffet style with something for everybody, meat eaters and vegans alike. On Sunday and Wednesday, we will have fresh corn-on-the-cob, live music, and refreshments in the afternoon. Take a look at that, the Florida Bicycle Safari is turning 39 years old. Where has the time gone? Each year this springtime cycling tour lives up to its expectations and leaves its attendees wanting for more. Well, the 39th will not be any different and will definitely deliver. Besides boiled corn dipped in whatever flavor that suits your taste buds, the Dixie-Grill will once again be catering all breakfasts and dinners, with a special treat of a meal on the 5th day. I get hungry just thinking about it. Carnivores and herbivores will all be happy, with plenty of options to choose from.